Impaired Oral Mucous Membrane: Disruption of the lips and/or soft tissue of the oral cavity. The oral cavity has seldom been described as a mirror because it reflects the health of a person. Alterations indicative of disease are seen as changes in the oral mucosa lining the mouth can reveal systemic conditions, such as minor irritations. These changes occur occasionally in all people and are usually viral-related, self-limiting, and easily treated. Patients can develop impaired oral mucous membranes for a number of reason involving NPO for 24 hours or more, prolonged use of steroids, immunosuppressants, or anti-neoplastic drugs, mechanical irritation, malnutrition, trauma, mouth breathing, inadequate oral hygiene, or decreased salivation. 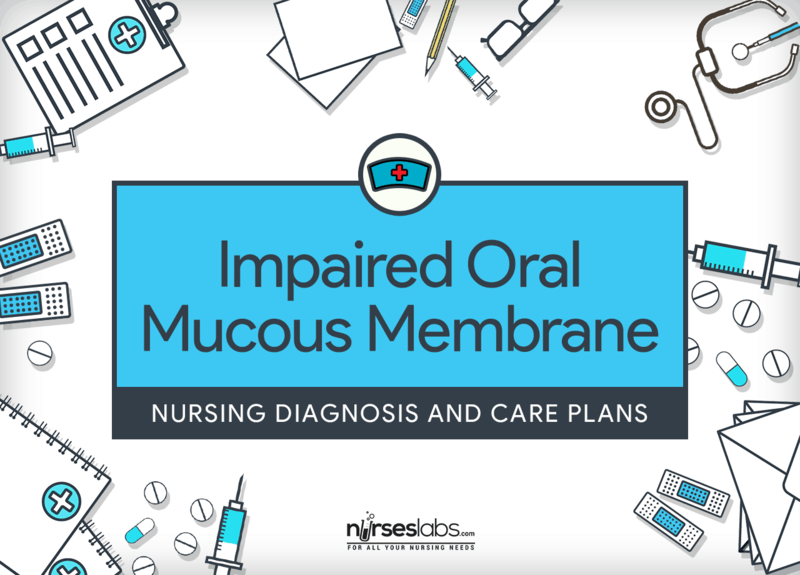 Oral mucous membrane problems can be encountered in any setting, particularly in home care and hospice settings. Prevention of oral disease and careful treatment planning are necessary to reduce oral disease and the need for, and potential conflicting outcome of, operative intervention. Patient maintains intact, moist oral mucous membranes that are free of ulceration and debris. Patient describes or demonstrates measures to regain or maintain intact oral mucous membranes. Patient verbalizes absence of discomfort or inflammation of oral mucous membrane. Assess oral cavity at least once daily and note any discoloration, lesions, edema, bleeding, exudate, or dryness. Refer to a physician or specialist as appropriate. Oral examination can show signs of oral disease, symptoms of systemic disease, drug side effects, or trauma of the oral cavity. Inspect for any indication of infection, and culture lesions as needed. Refer to a physician, nurse, or specialist as appropriate. Early evaluation promotes immediate treatment. Specific manifestations direct accurate treatment. Evaluate nutritional status. Malnutrition can be a contributing cause. Oral fluids are needed for moisture to membranes. Observe ability to eat and drink. Difficulty or inability to chew or swallow may occur secondary to pain of inflamed or ulcerated oral and/or oropharyngeal mucous membranes. Note patient’s oral hygiene practices. Information gives direction on possible causative factors and guidance for subsequent education. Check for mechanical agents such as ill-fitting dentures or chemical agents such as constant exposure to tobacco that could create or develop trauma to oral mucous membranes. Irritative and causative agents for stomatitis should be eliminated. Examine after removal of dental appliances. Use a moist, padded tongue blade to gently pull back the cheeks and tongue. A well-organized assessment should be performed of listed sites using a tongue blade to show areas of the oral cavity. Denture removal is necessary because lesions may be underlying and further irritated by the appliance. Caregivers also need to be informed of the importance of these assessments. Assess the severity of ulcerations involving the intraoral soft tissues, including the palate, tongue, gums, and lips. Sloughing of mucosal membrane can progress to ulceration. Monitor patient’s fluid status to determine if adequate. Dehydration predisposes patients to impaired oral mucous membranes. Determine patient’s mental status. If patient is unable to care for self, oral hygiene must be provided by nursing personnel. The nursing diagnosis Bathing/Hygiene Self-care deficit is then also applicable. Plan and implement a meticulous mouth care regimen after each meal regularly and every 4 hours while awake. Mouth care prevents formation of oral plaques and bacteria. Patients with oral catheters and oxygen may require additional care. Increase the frequency of oral hygiene by rinsing with one of the suggested solutions between brushings and once during the night especially if signs of mild stomatitis (dryness and burning; mild erythema and edema along mucocutaneous junction) occur. This will reduce further damage and may promote comfort. Provide systemic or topical analgesics as prescribed. This will provide comfort and relieve pain. Discontinue flossing if it causes pain. Increased sensitivity to pain is a result of thinning of oral mucosal lining. Explain that topical analgesics can be administered as “swish and swallow” or “swish and spit” 15 to 20 minutes before meals, or painted on each lesion immediately before mealtime. Each treatment must be performed as prescribed for optimal results. Instruct patient to hold solution for several minutes before expectoration. This measure enhances therapeutic effect. Explain the use of topical protective agents. A variety of more protective agents are available to coat the lesions and promote healing as prescribed. This medicated gel contains benzocaine for pain and is painted on the lesion and allowed to dry to form a protective seal and promote healing of mouth sores. This is a bioadherent oral gel that covers the oral cavity and forms a protective barrier to relieve pain. Substrate of an antacid and kaolin preparation. The substance is prepared by allowing antacid to settle. The pasty residue is swabbed onto the inflamed areas and after 15 to 20 minutes, rinsed with saline or water. The residue remains as a protectant on the lesion. This agent decreases the incidence and duration of severe oral mucositis in patients with hematological cancers undergoing high-dose chemotherapy followed by bone marrow transplantation. Give local antimicrobial agents as ordered. Mycostatin, nystatin, and Mycelex Troche are commonly prescribed. Stop the use of a toothbrush and flossing. Brushing could increase damage to ulcerated tissues. A disposable foam stick (Toothette) or sterile cotton swab is a way to gently apply cleansing solutions. If patient does not have a bleeding disorder and is capable to swallow, encourage to brush teeth with a soft pediatric-sized toothbrush using a fluoride-containing toothpaste after every meal and to floss teeth daily. The toothbrush is the most important tool for oral care. Brushing the teeth is the most effective method for reducing plaque and controlling periodontal disease. Use tap water or normal saline to provide oral care; do not use commercial mouthwashes containing alcohol or hydrogen peroxide. Also, do not use lemon-glycerin swabs. Alcohol dries the oral mucous membranes Hydrogen peroxide can injure oral mucosa and is remarkably foul-tasting to patients. Lemon-glycerin swabs can result in decreased salivary amylase and oral moisture, as well as erosion of tooth enamel. Maintain the use of lubricating ointment on the lips. Lubrication prevents drying and cracking. Encourage a diet high in protein and vitamins. Serve foods and fluids lukewarm or cold. Serve frequent small meals or snacks spaced throughout the day. Encourage soft foods (e.g., mashed potatoes, puddings, custards, creamy cereals). Encourage the use of straw. Encourage peach, pear, or apricot nectars and fruit drinks instead of citrus juices. Dietary modifications may be needed to facilitate healing and tissue integrity. Use foam sticks to moisten the oral mucous membranes, clean out debris, and swab out the mouth of the edentulous patient. Do not use to clean the teeth or else the platelet count is very low, and the patient is prone to bleeding gums. Studies have revealed that foam sticks are apparently not effective for removing plaque from teeth. Maintain inside of the mouth moist with frequent sips of water and salt water rinses. Moisture promotes the cleansing effect of saliva and helps avert mucosal drying, which can result in erosions, fissures, or lesions. Provide scrupulous oral care to critically ill patients. Cultures of the teeth of critically ill patients have produced notable bacterial colonization, which can cause nosocomial pneumonia. If whitish plaques are evident in the mouth or on the tongue and can be rubbed off readily with gauze, leaving a red base that bleeds, suspect a fungal infection and contact the physician for follow-up. Oral candidiasis (moniliasis) is remarkably common secondary to antibiotic therapy, steroid therapy, HIV infection, diabetes, or immunosuppressive drugs and should be treated with oral or systemic antifungal agents. Refer the patient to the dietitian for instructions on the maintenance of a well-balanced diet. Nutritional expertise may be necessary to optimize the therapeutic diet needed to facilitate healing. Instruct patient to avoid alcohol or hydrogen peroxide-based commercial products for mouth care and to avoid other irritants to the oral cavity (e.g., tobacco, spicy foods). Oral irritants can further break and infect the oral mucosa and increase the patient’s discomfort. Lightly brush all surfaces of the teeth, gums, and tongue with a soft-bristled nylon or foam brush. Floss smoothly. Careful mechanical cleansing and flossing loosens debris, stimulates circulation, and reduces risk of infection. Brush with a nonabrasive dentrifice like baking soda. Baking soda promotes further cleansing of teeth. Remove and brush dentures properly after meals as necessary. Dental care is a key to reducing risk of infection and improving appetite. Rubbing and irritation from ill-fitting dentures promote breakage and injury of the oral mucosa. Rinse the mouth thoroughly during and after brushing. Removing food particles decreases risk for infection related to trapped decaying food. Include food items with each meal that require chewing. Chewing stimulates gingival tissue and promotes circulation. Educate patient on how to inspect the oral cavity and monitor for signs and symptoms of infection, complications, and healing. Build on patient’s existing knowledge to develop an individualized plan of care. Educate patient on how to implement a personal plan of oral hygiene including a schedule of care. Encouragement and reinforcement of oral care are significant to oral outcomes.